This post is part of the iHomeschool Network’s 10 in 10 link up. Today’s topic is top 10 reasons my child loves homeschool. This was a fun topic because it required that I get some input from my daughter to discover what she would actually say about “loving” homeschool. As we talked and I took notes, it became clear that every reason she gave related in some way to her creative bent. So I decided to take that approach to the list and share the top ten reasons why a creative child will prefer to be homeschooled. The creative mind is a very interesting thing. It has flashes of inspiration that require immediate follow-through. I used to be suspect of my daughter’s requests for time to work on her latest project. I assumed she was merely trying to avoid school work. But it turns out that her creative urges are almost overpowering. When an idea strikes, she can think of nothing else until she has tried it. I learned that doing school during those moments was counterproductive. She normally returns from her creative adventures with a renewed focus for academics. So I trust her creative binges and allow her the time she desires. All homeschoolers love the flexibility of this type of education, but it seems even more critical for the creative child. The second reason Sprite offered for enjoying homeschool is that she can integrate her creative pursuits into her education. She cited clay models for science or drawings for history as two examples of how she can use her artistic skills to demonstrate her learning. Although public schools sometimes call for these kinds of projects, they are rare. With homeschool, she has a lot of freedom to choose how to narrate a lesson, whether it be a traditional written explanation or a more unusual format. Besides having flexible time, there is simply more time overall for getting crafty. No busy work, no “homework,” no tests to cram for. We can focus our attention on school for a few hours a day, and when that is done, we have plenty of leisure for personal hobbies. 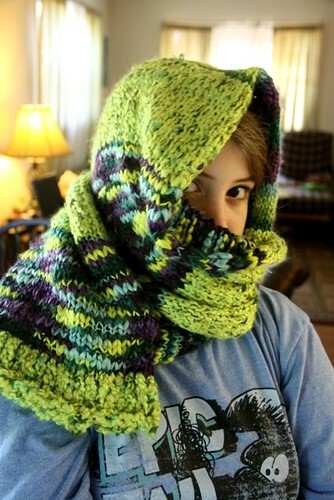 Sprite recently made a gorgeous scarf on a nifty knitter loom. She did most of it while listening to an audio book (from the Fablehaven series). She spent approximately 8 hours on that project and ended up with a beautiful article of clothing that she can wear with pride. Creatives may not perform as well on traditional tests as the more linear, left-brained thinkers, but in a homeschool environment, we have more freedom to evaluate on other, more favorable aspects of learning. Sprite is wrapping up seventh grade, and I’m thinking forward to high school when this will be very important. I was quite surprised when Sprite cited this as a reason to homeschool. Obviously she is thinking about high school and college admission, too! My mercenary child said that she often persuades me to buy craft supplies by claiming they are school supplies. Sneaky. But very true. The lines between school and crafts often get blurred. She has learned that art supplies don’t count, and she uses that to her advantage. We have enough Sharpie markers to outfit an army of artists, buckets of adhesives, and reams of paper in all patterns, colors, and thicknesses. Yes, public schools take museum field trips, but not as often as we go. And a trip to the Brooks Museum homeschool program is our school for the day (well, with the addition of some Teaching Textbooks math). I guess this puts me in the “cool mom” category. But why not? We bought this table just for crafts and homeschool. 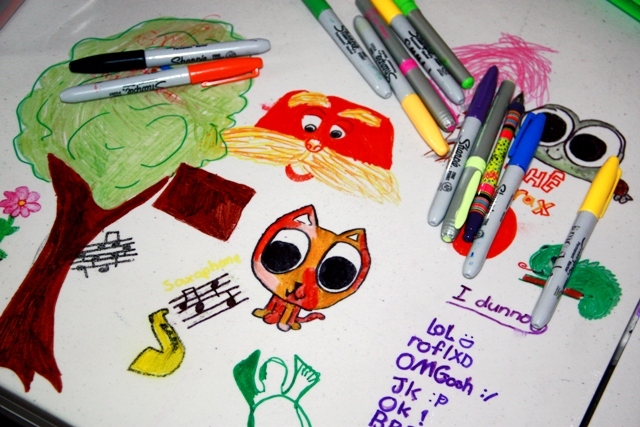 I find the Sharpie sketches add a lot of interest to an otherwise boring table. Yes, I still read aloud to Sprite (against Miss Mason’s advice). And while I do that, she can keep her hands busy with whatever her latest passion is — sculpey clay figures, knitting, drawing, zentangles, or mod podge creations. I would have never considered this benefit of homeschooling the creative child. But it was an aspect that Sprite was very adamant about. She has obviously seen enough criticism of her work in other arenas to fear that public school would be the same. With homeschooling, it is only family who sees her work. She can be very selective of who sees her projects outside of the confines of supportive parents. This last reason is one that hit me after reading Penelope Trunk’s amazing blog post The Argument Against Raising Well-rounded Kids. When you homeschool a creative child, you can allow more time, more flexibility, more resources, and more support for creative pursuits. I’ve already mentioned all that. But each of those benefits work together to allow a child to become a creative specialist. Why dwell on weaknesses? (To do so is depressing drudgery.) But to emphasize strengths creates a confident child who has a leg up when it comes time to specialize in adult life. We tailor our Charlotte Mason homeschool to highlight Sprite’s unique creativity. If you have a creative child, please consider homeschool as an option. You will be able to nurture that creative spirit in a way that public school simply cannot afford. Goodness! I thought I was so creative in writing that same topic. Hilarious! Love your list and all the pictures! I appreciate this post and I think it’s very applicable for us too. We’re just getting started in homeschooling and I have a very creative child as well, but mine is my son. And if creativity is undervalued and pushed to the side in public schools even with girls I think it’s just doubly the case when it comes to a creative boy. I’m looking forward to giving him room to pursue his gift of creativity through our homeschool without pressure or judgment. We just visited with our facilitator yesterday and I was discussing this very thing with him. My oldest specializes in photography and piano, my second in drawing and painting and my youngest is still undecided. The beauty of HS-ing though is that they have this freedom. Usually when they didn’t excell in a certain area they would be discouraged, but in this enviroment they flourish in the areas they love because they are encouraged to excell in their chosen interests. I love that. What a beautiful scarf/shawl Sprite made — I really admire how you just let her be HERSELF and don’t try to fit her into a mold of “doing school” each day. We celebrate this kind of creativity in adults, so why not children, too? Love your list! All good reasons for homeschooling. The scarf is truly beautiful, thanks for sharing. I still read to my kids, too. In fact, it is usually built into the schedule as their art time and my read aloud time. We just finished Oliver Twist and I am amazed they liked it so much. But then, we are big fans of Twain so it would follow that they’d appreciate Dickens as well. I just wish my most creative one would return to his work with renewed vigor. Love this list! It’s so wonderful to be able to spend hours pursuing our interests. Once a friend and I took our kids to a local museum every day for weeks. The kids were very interested in wolves so we immersed ourselves in the wolf exhibit. When even made a lapbook while we were there. The staff was so helpful in answering their questions and loved that their finished products. I’m in awe of her desk. You are the cool mom! why dwell on weaknesses?! agreed. I make sure to cover the bases in weak areas, but then we move on to their strengths (which are also often their passions). a sure way to instill the LOVE of learning. have a great weekend, Jimmie! I think it is wonderful that she sees homeschooling as such a positive part of her life. It makes me wonder if I would have pursued other activities that I enjoyed, even though I wasn’t the best at them, if I didn’t have to deal with outside criticism. I love this. My girls are both very creative, which was a big reason why we took them out of public school and chose to homeschool them. In school their creativity had parameters…but we felt it best for them to be able to have more freedom. Our favorite thing about homeschool lifestyle is that, on average, “school” takes 3-4 hours a day and they then have the rest of their time to create! Hi Jimmie! I’ts been some time since I’ve visited homeschooling blogs due to the fact that we are only two years away from my hanging up my ” homeschooling” hat for good, but I always enjoyed your posts and decided to wonder over…I’m so glad I did! I love this! I understand it can be scary for some homeschooling parents to think of art as ” school ” but it is. I never looked at what our children made as the measuring stick for how they were doing in art. Even though it was always fun to see the outcome! Expressing creativity and exploring different art mediums builds confidence in a child. It also gives them a chance to find out if they have any special talents. Both of our children write lyrics and one of them composes music. I strongly believe it was the freedom they had as young homeschooling children to play, discover, and create that laid the foundation for them having the confidence to be bold in their creative choices now. I know it will serve them their whole lives through! I also believe anyone can ” teach art “, various techniques etc… but true creativity comes from with in and that needs to be nurtured from the very beginning! Wishing you and Sprite many more creative homeschooling years! Wonderful reasons, Jimmie and I so agree! Well done on that lovely scarf, Sprite! I have watched my kids grow and develop in areas of creativity and innovation that could only be possible at home! My eldest has a passion for sewing and it is not part of her homeschooling curriculum, but her business that flows from her sewing is fuelled with skills she learnt in homeschool. As homeschooled children they are encouraged to be an individual and to think for themselves and express themselves with conviction. They can be schooled in life skills such as persistence, perseverence and excellence. These attributes, along with creativity are a wonderful equipping! I think we may live in the same neck of the woods! We enjoy going to the Brooks Museum as well, although my creative girl is a bit younger than yours! It’s nice to see someone from around here doing a bit of “untraditional” homeschooling (not using ABeka or Bob Jones). I don’t see that often and people often look at me like I have two heads when I tell them we are a CM style family! I just so love that scarf, what a clever girl. 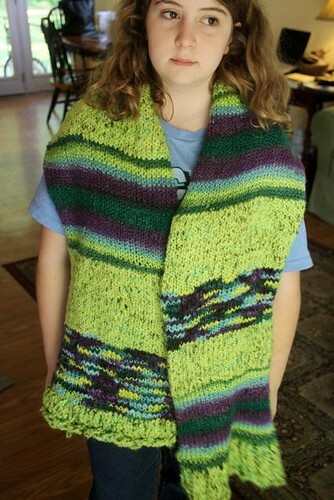 What exactly is a niffty knitter loom, my daughter would love one? Thank you, this is very interesting. I went to public school. I was slightly above average in some area of academics. I excel however in creativity! I never liked to read or did very well in English. In grade 11 I spent 3 months on an exchange and when I returned I had to do 5 months of work in 2 months. That semester I brought my average up 6% above normal. Since then I have always realized I am a self-taught learner and public school held me back from my potential. Even at that time I recognized I probably should have been home-schooled. I long so much to homeschool my children. They struggle in school and one has a learning disability but I am a single mom and it is so hard to find a way to make it happen. Another interesting point regarding your article is that I actually just left my job last week because the job would not allow me to exercise my creativity and flex my hours. Your article helped me see why I long so much for this flexibility. I am aiming to work from home to better care for my kids so I am going to open my own business. This is hard work for a single mom but being there for my kids and following my dreams is more important than money. Oh, Shani. I so hope that you can find a way to work at home, doing creative freelance work while you homeschool your children. It can be done! It is not easy. Not at all. But it is possible and so, so worth it. I pray you will find a way to make it happen. I am unable to homeschool for financial reasons at this time (but I will be doing so as soon as I am able! ), I’ve just got to find a way to “contain” this creativity! If my house were big enough, I’d make her a “craft room,” but we don’t have a room for that. She literally walks around the house cutting paper into flower leis, taping blankets to ceilings to make canopies over beds, wrapping yarn around toys to make mummies, and taping paper bowls upside down to her door to look like drums. And that doesn’t include the days where she decides she wants to create a recipe. 1. your relationship — you value what she values. 2. her future — she can press into her creative side and develop that trait. Thanks, Holly! Yes, homeschooling affords them the flexibility to pursue their passions. I love the options we have! Homeschooling provides a safety net for kids. Rather than stifle or eliminate their creative energy, homeschooling encourages and nurtures it. These are such great reasons. My creative kid loves that art supplies are not part of “school” and that he has more free time available.